Still following our young scholars career, here is the first column from Thierry Ferland. He is Lori-Ann Matte’s figure skating partner. Lori-Ann has previously written about their competition in Minsk, Russia. “Who would have guessed that, one day, we would go to Gdansk in Poland? A town near the Baltic Sea» exclaims Thierry. He pursues in saying: “The beach in Gdansk was beautiful and we went there a few times to see the sunrise and sunset”. 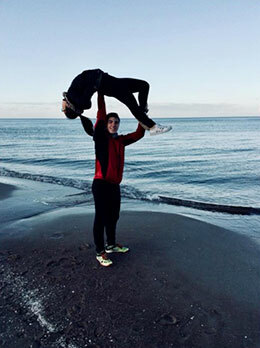 The photos that Thierry sent us prove that he and Lori-Ann have also used this free time to practice a few figure skating lifts.